Information about West Mesa Aquatic Center. View holiday hours at West Mesa. West Mesa Aquatic Center is the site of the City's newest Olympic pool. 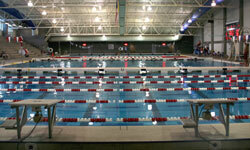 The pool can be set for eight 50-meter lanes or two-dozen 25-yard lanes. The pool also has two 1-meter diving boards and a 3-meter diving board. The West Mesa Aquatic Center also features an indoor recreation pool that has a tower water slide with beach-like zero-slope design. It is handicap accessible and great for birthday parties. The outdoor pool is larger than the indoor pool and has two water slides. Children younger than 10 must be accompanied by a responsible adult. Children ages 8 and under must be supervised by an adult at all times while in the water. Therefore, they both need to be in the water. Information about hours at West Mesa Aquatic Center. Rec Swim 11:30 a.m. - 1:30 p.m. Lap Swim Early Bird Lap Swim Monday - Friday (use North entrance) 5:30 a.m. - 8 a.m. Noon Lap Swim Monday - Friday 11:30 a.m. - 1:30 p.m.
Evening Lap Swim Monday - Friday 6 p.m. - 8 p.m. Weekend Lap Swim Saturday - Sunday Noon - 4 p.m.
Indoor Slide Pool 5:30 p.m. - 8 p.m.
Water Exercise Monday, Wednesday, Friday 9 a.m. - 10 a.m.
Monday, Tuesday, Thursday 7 p.m. - 8 p.m. Effective May 25, 2019 - Aug. 11, 2019 During summer recreational swim sessions, a wristband is required for all swimmers and spectators. Wristbands can be purchased Monday to Friday starting at 5:30 a.m.; 11 a.m. on the weekends. Lap swimmers are not required to have wristbands. Weekend Lap Swim Saturday - Sunday 12:30 p.m. - 2:30 p.m.
Recreation Swim Olympic, Indoor & Outdoor Pools Monday - Friday 12:30 p.m. - 2:30 p.m.
Olympic, Indoor & Outdoor Pools Saturday - Sunday 12:30 p.m. - 2:30 p.m. Outdoor Pool Monday - Friday 6 p.m. - 8 p.m.
Indoor Pool Friday 6 p.m. - 8 p.m.
Pre-Sale for wristbands go on sale on Fridays at 5:30 a.m. and weekends at 11 a.m.
Monday, Wednesday, Friday 9 a.m. - 10 a.m.
View Summer 2018 special events.